Does Green Tea Contain Tannins? Whether you make it occasionally at home, drink it only when dining at an Asian restaurant, or have it every morning when you wake up, green tea has a number of health benefits. Green tea is one of the most widely consumed drinks in the world, though it not widely in the United States. However, its reputation as a healthy beverage due to its high antioxidant concentration may eventually make it more popular than black tea. All teas — aside from herbal or rooibos teas — are produced from the leaves of the tea plant, also known as Camellia sinensis. The different types of tea produced from Camellia sinensis leaves — be they black, green, white, yellow or oolong — are produced through an oxidization process. Black tea is fully oxidized, the process taking between two to four hours. Oolong tea is partially oxodized and green teas are not oxidized at all. Yellow and white teas are a type of green tea, so they are also not oxidized. It is the different oxidization levels that produce the distinctive tastes of each tea. Tannins are a type of polyphenol that comes from plants. A strong antioxidant, tannins are found in large quantities in green tea. Antioxidants protect your cells from toxins in the environment, such as cigarette smoke and pollution. The tannins in green tea help boost immunity and provide protection from these harmful toxins. Green tea may be associated with a number of possible health complications, including reducing the amount of iron absorbed by your body. This occurs because the tannins in green tea bind to iron. Low iron levels or iron deficiency anemia can cause symptoms of tiredness and breathlessness. 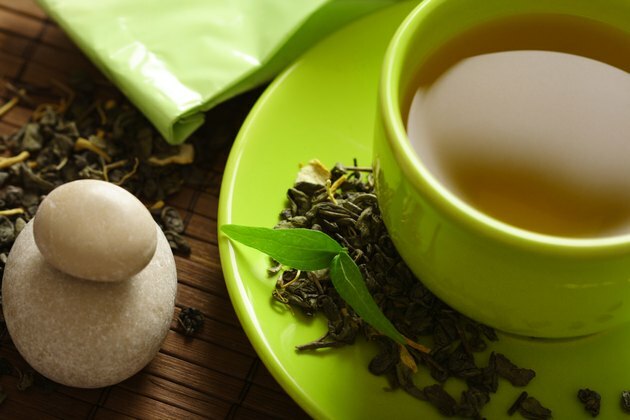 As well, green tea may interfere with medications used for blood pressure, heart conditions or depression. If you have any concerns about your green tea consumption, speak with your doctor. The University of Maryland Medical Center recommends drinking between two and three cups of green tea each day. This would provide a dose of 240 to 320 milligrams of polyphenols daily. Steep the tea for five minutes, and drink immediately. When purchasing green tea, buy whole, loose leaves of high-quality green tea rather than green tea bags. The leaves in the tea bags are frequently ground up first, which can reduce their antioxidant content. Complementary and Alternative Medicine for Cancer: Green Tea - Does it Work?